This made me laugh a bit, as we RMB Kids have sometimes been working late hours these days, as Beijing night falls earlier and earlier, and the days get colder and colder. I sent a message to Winnie (who is an architectural student, one of the creators of Green Map HK, and my former studio-mate from Fo Tan), asking where she got this information. She replied that it was taken from the Song Dynasty architectural manual “Yingzao Fashi” (營造法式) (which she was reading even though her study period is Qing Dynasty gardens and city of Yangzhou). I became curious about this book, and after a bit of Googling, found that it was written by Li Jie (李誡), an architect and author who unified several older treatises on architectural methods into one document, which was then published by the Song Emperor Huizhong in 1103, to provide a standardized methodology to architects, engineers, and government officials. 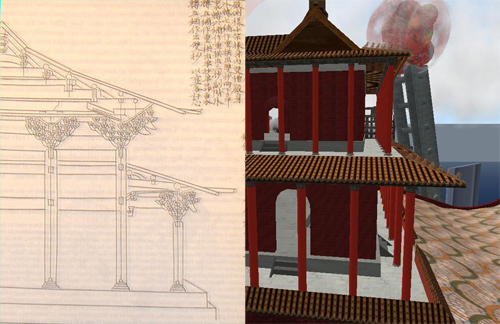 Especially as we are in the process of exploring the possibilities of feng shui in Second Life and RMB City, it is interesting to think about traditional bodies of knowledge, and how and when they are standardized. The idea of an “instruction manual” with absolute rules, guidelines, and styles for building a palace, a city, an empire, is simultaneously worrying and attractive. Would it help or hinder creativity? In some unintentional way, have China Tracy and Jia Nootan (RMB City’s Artistic Coordinator) been forming our own “Yingzao Fashi” in the process of working with our engineers Avatrian? In the rapidly-evolving field of virtual architecture, where cities can rise in the blink of an eye and disappear as quickly, is there any need for such discrete units of systematized knowledge? Our RMB City Archive, and the upcoming feng shui project, aim to explore just this.